As I said in my previous post, the recent Court of Appeals case, Tierney v. Berger appears to have corrected a silly rule in Wisconsin law: A prohibition against “mixed” orders, which is an order which includes dollar-expressed and percentage-expressed support orders. Writing that column made me think of other silly laws in this field. 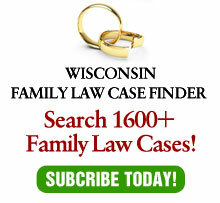 So, here is a link to my followup column, which appeared in the July 26, 2012 edition of the Wisconsin Law Journal.